Last week, we had Gryfe’s brother, Lu, with us and the dogs had a blast together for the first four days, until Gryfe stepped on some mystery object in the woods/yard (glass? metal?). Something so sharp that it sliced a big clean cut through one of his toe pads on his left, front paw. One trip to the vet later, his paw is wrapped in bandages, he’s on antibiotics, and he’s wearing the “cone of humiliation”. The cone didn’t last long (we took pity on him), but the bandage was supposed to stay on for a week and, worse, no running, jumping playing, getting it wet. What a way to spoil a dog’s dream week with his brother. 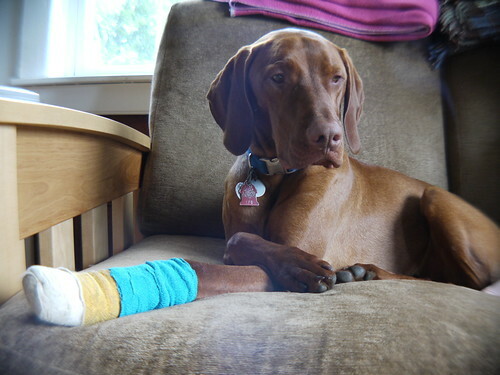 He survived and his bandage is off, and he’s spending this 4th of July weekend with Lu, making up for lost time. Yeesh, though. First Hyla’s ankle, then I hurt my knee in a freak trying-to-change-my-pants-when-I-was-too-tired accident, and now Gryfe’s paw. If you’re related to us, please watch out for your limbs. Next Post She’s ready, but are we?